With Platinum Party Bus Limos, let us be your limousine of choice when looking for a reputable firm in and around the Scarborough area. With many different limousine companies that you can choose from, it is important that you do your research and determine what it is exactly that you need and what you will look for when renting a limousine in Scarborough. 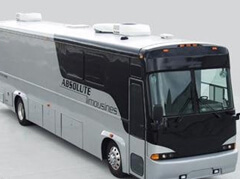 If it is limousine buses, either party limo buses or larger more luxurious limo buses that you are looking to reserve for your wedding, prom or a night out, then we suggest that you go with Platinum Party Bus Limos, offering you with the ability to choose from many different limousine buses such as party buses that seat 18 – 26 passengers. For larger more spacious and luxurious limousines, you can choose from limo buses that range from 30 passengers to 50 passengers, offering you a ride that you will remember in Scarborough. These large limo buses are great for night out celebrations including casino limo rides from Scarborough to Niagara Falls or Casino Rama, whatever you choose. Contact us today to see how we can transform your night out to some special with a limousine party bus from Platinum Party Bus Limos.